Since Christmas I have been saving up some Best Buy gift cards and finally loaded them up on a purchase. I bought a new laptop this summer and decided on the inexpensive, sleek and small Chromebook. It's not for everyone. But, I am sure I will enjoy using this in the living room while watching tv to browse the net. My plan is to also write up a review especially for this blog so that I can add my two cents as far as how a Chromebook could be used by schools. Google is starting to lease Chromebooks to both schools and businesses. They might make some sense, but I want to be sure to understand them better before putting my opinion on it. Hope summer is treating all of you well. I am busy with going to physical therapy three days a week to work on improving my strength and balance as I recover from my first major flare of Multiple Sclerosis. The Trilogy - "The Hunger Games"
and I am about to read the first book of "A Song of Fire and Ice" - A Game of Thrones. Hope everyone has had a happy and safe summer so far. I can not tell you and fully express how grateful I am to everyone. So many have given and wished me well, it is overwhelming. The support has really given me the push I have needed to realize that even if I have been given a bad break, there are so many great people in my life. Link to my post about Operation Bald Eagle - Head Shaving for MS Awareness. 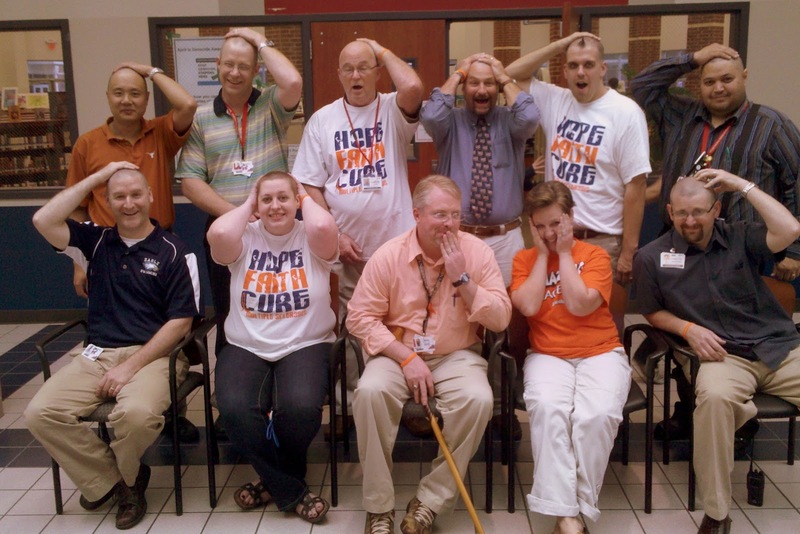 Link to my post sharing my Email to the AHS Faculty with lots of pictures of the events during the MS Awareness campaign. 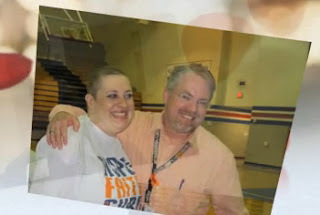 Link to my AHS Softball Benefit Game Video & Thank You Video to the AHS Patriettes. Link to our pics modeling the MS Awareness T-Shirts. 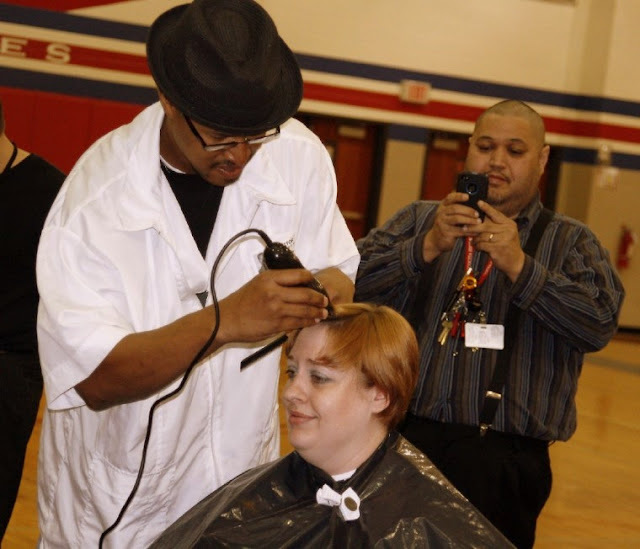 Mr. Scalia should never have scheduled a test on the same day as the head shaving. These two got him good! 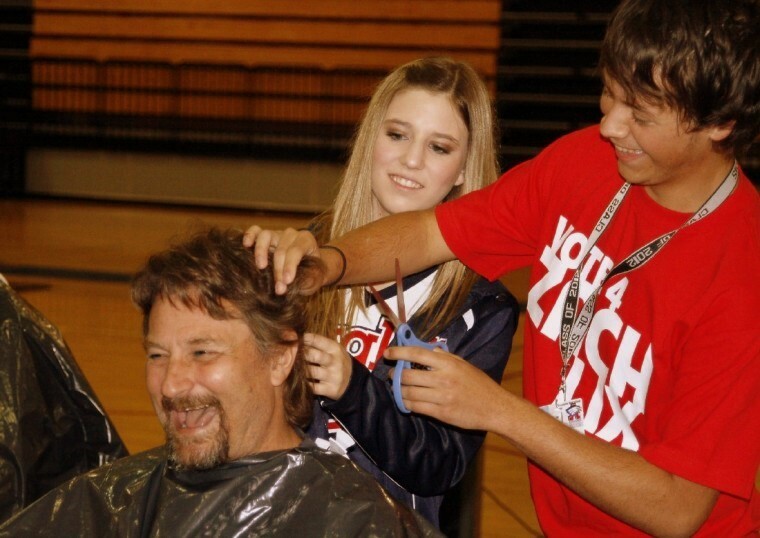 My former student Kristin did a wonderful job on Mr. Head's head. 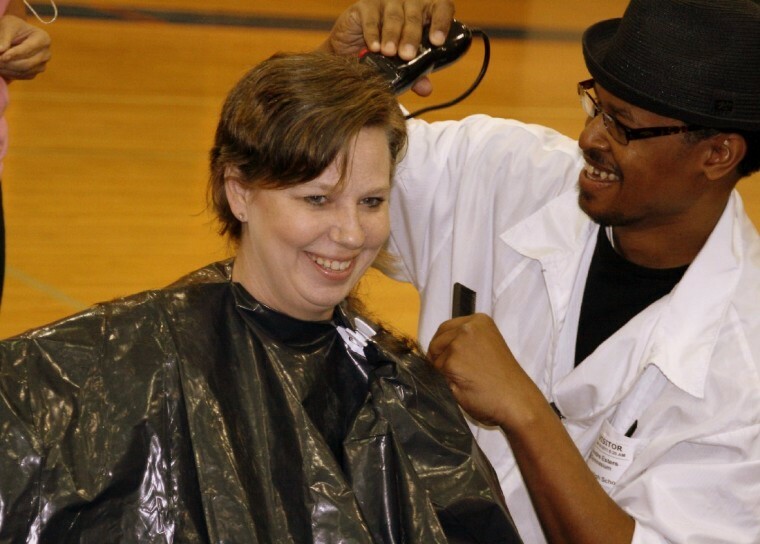 :) Mr. Head's family has been impacted by MS.
Ms. Davison is beautiful with or without hair. Thank you neighbor for raising over $1500 for MS Awareness! You ROCK. 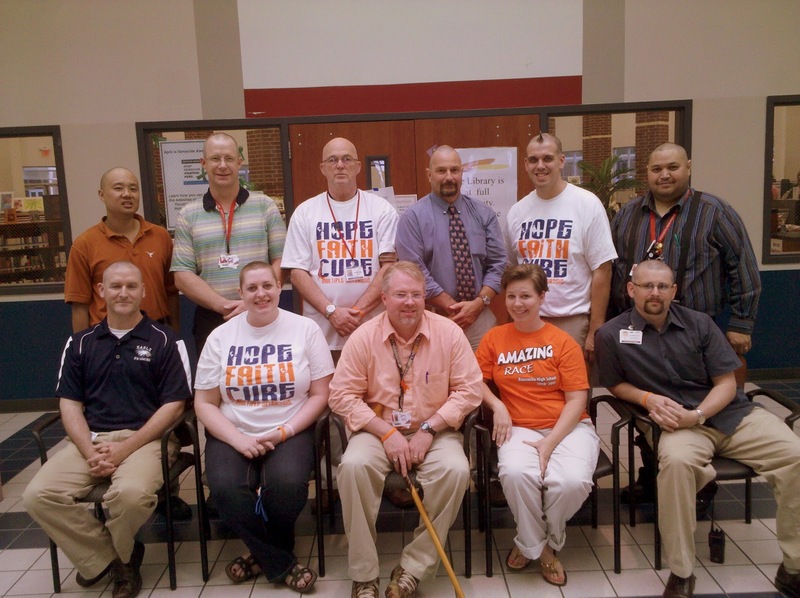 Here are a few videos from the MS Awareness Campaign that AHS has done. This was a great event. 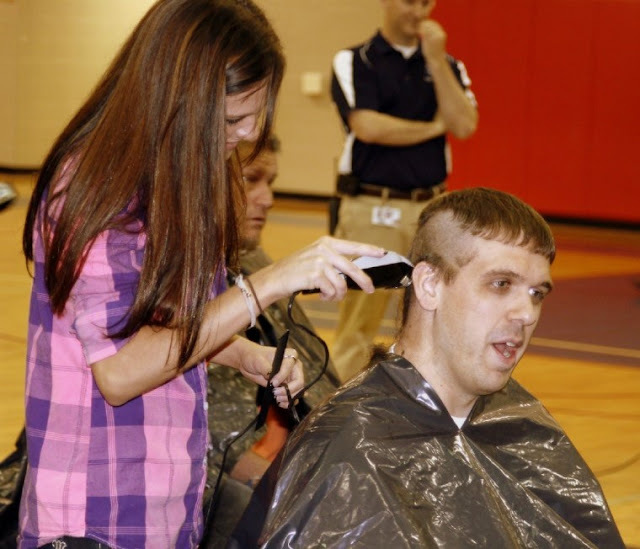 Thanks to everyone at AHS who donated money in jars to each of these people (and many others who raised money, but did not get their hair cut). Ms. Davison raised over $1500 herself! Thanks to Mr. Scalia for coming up with the head shaving idea. Thanks to Mr. Anderson for helping to organize and advertise. 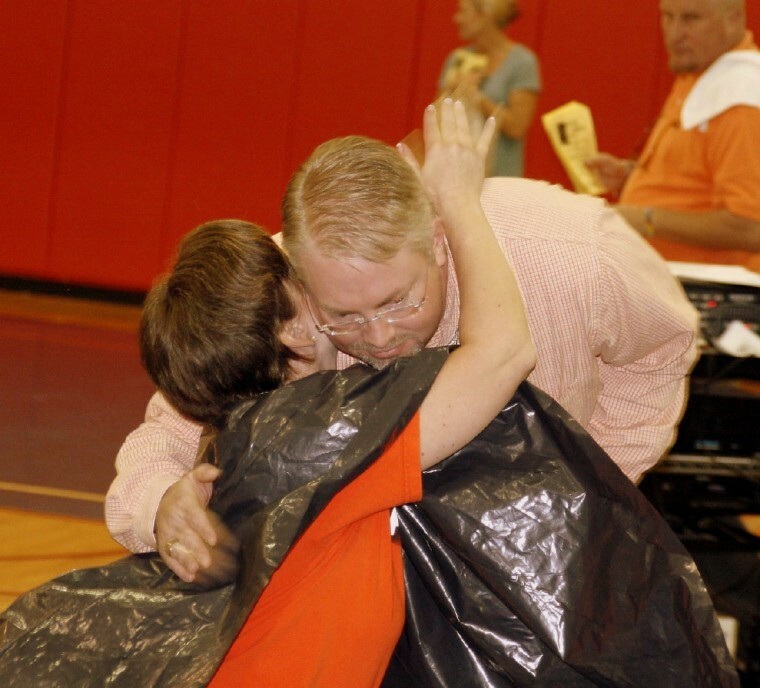 Special thanks to Mr. Campbell who has been organizing and spearheading all of this MS Awareness project. I wanted to take a moment today and write everyone to express how thankful I am about the Multiple Sclerosis campaign that Mr. Campbell, Mr. Scalia and many others have helped to orchestrate. Friday was an especially amazing day for me. Seeing all of those orange, blue and white t-shirts, ribbons and wrist bands was awesome. 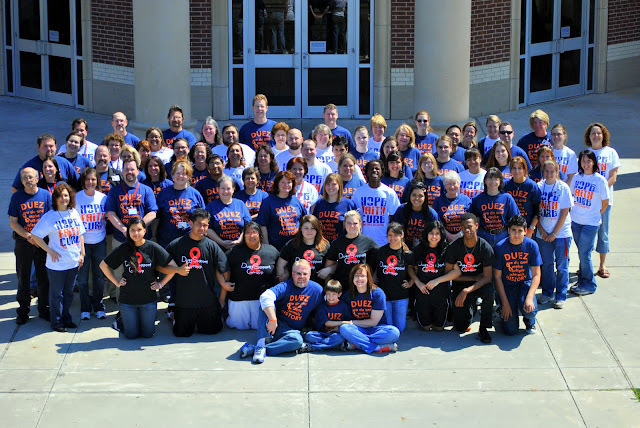 MS Awareness T-Shirt Support day at AHS. Thanks to everyone who took the time to come out after school for the pic. 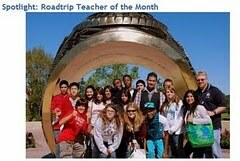 Mr. Duez, Aidan and Mrs. Duez are seated at the bottom. Also, I wanted to send along some news about just what is going on with me and what MS is exactly. I do not have the opportunity to see many of you as often as I would like. Obviously, I know this email is very long and I apologize for that and I realize many won’t have the time to read it all. But, I wanted to be sure to include some information that people have been asking me about. Because we have such a large school and are so spread out, I know others might have these same questions on their mind, but may not have the opportunity to ask. When someone hears the scary word “Sclerosis” they figure it must be pretty bad and may not even know what that means. Our awesome Latin teacher Shawn Jennings might know. In Latin it means ‘hardening’ (or scarring). MS is a chronic autoimmune disease of the central nervous system in which gradual destruction (hardening and scarring) of the myelin occurs. There is no cure for the disease and most patients see a continuing decline in their health and abilities after being diagnosed. The myelin is the sheath or covering of the nerves. In simple terms it is much like an electrical cord. The plastic/rubber portion that covers an electrical cord is like the myelin of the nerves. The inner wiring of an electrical cord is like the nerves itself. When MS attacks it eats away at the myelin and exposes and often destroys the nerve as well. In the same way an old extension cord might fail to continue to function when the plastic/rubber coating is worn away is exactly what happens with MS. The nerves lose their ability to communicate and deliver signals. Image via WikipediaBecause MS strikes the central nervous system and the brain in different areas for different people, it can be a very hard disease to pin point and diagnose. It can also be very strange for people to understand because the symptoms for one person may not even exist for another person. Many times the destruction of these nerves leads to weakness, numbness or tingling, and sometimes pain. My MS episodes started in 2010 right before spring break. I suddenly became very, very dizzy in class. It was also accompanied by severe fatigue. Doctors could not quite figure out what was happening until I had a major flare of the disease. That occurred during Thanksgiving weekend last fall. I was unable to get up out of bed one morning. I lost the ability to use my legs and even sit up without assistance. Also my pain level was incredibly high during this flare. This led my primary care doctor to realize my symptoms were much more serious and sent me to a neurologist. That also began the tremendous amounts of testing, MRIs and a very nasty spinal tap. As I began the new year, doctors prescribed high dose treatments of IV and oral steroids to help my body shorten the length of the attack or flare. Currently I have regained a lot of function, but have weakness in my legs (especially my left leg) and some weakness in my arms and hands. My number one symptom is fatigue, often a common symptom for MS patients. About 85% of us have severe fatigue. My pain levels are very manageable. A great way to explain it to someone who is a teacher is this – I have first week legs. Remember how your feet ached and legs burned during the first week back to school? That is how my legs feel every day. 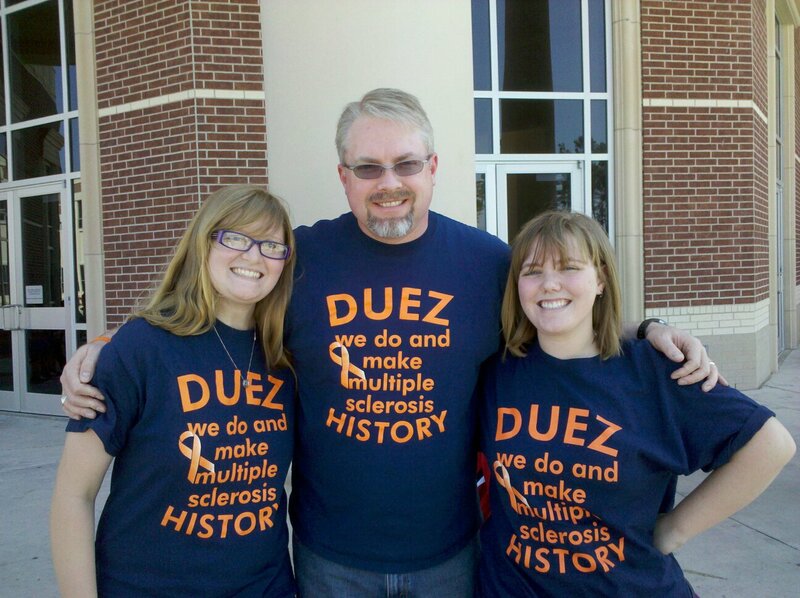 My sister and aunt also have Multiple Sclerosis. My uncle (through marriage) and his sister have also battled this disease. So MS is something important to my family. Mr. Duez and a former student. My doctors have been very aggressive in treating this. I will begin daily injections of a drug soon (pending insurance approval). This will help limit the number of flare ups of the disease over a long term period. This is the best course of action available to us right now. When patients have taken this drug during the first year of onset of MS the results have been good. The biggest drawback (besides sticking myself with a needle every day) is the cost. Because MS is categorized a rare disease, the costs for drug therapies are very high. This is part of the reason that the fund-raising campaign is important to me. But, the biggest reason is that the money donated to the MS Society will go towards helping researchers find a cure. They have made incredible strides in the past 10-15 years. With further funding researchers may one day be able to crack this very difficult code and find a cure for Multiple Sclerosis. I have adopted an initialism that helps me focus on the positive: DFTBA. It means: "Don’t Forget To Be Awesome." There are days that I feel a lot less than awesome. But, I have to remind myself that MS is not me. It just wants to get in the way of me being “Mr. Duez.” So I say DFTBA and turn on my old self that is buried down there under this MS haze. It has helped me change my mind set in an instant. So, DFTBA! Thank you again. 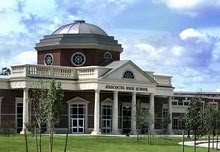 I am very fortunate to work at Atascocita High School and I count my lucky stars every day. It’s a great day to be an Eagle! 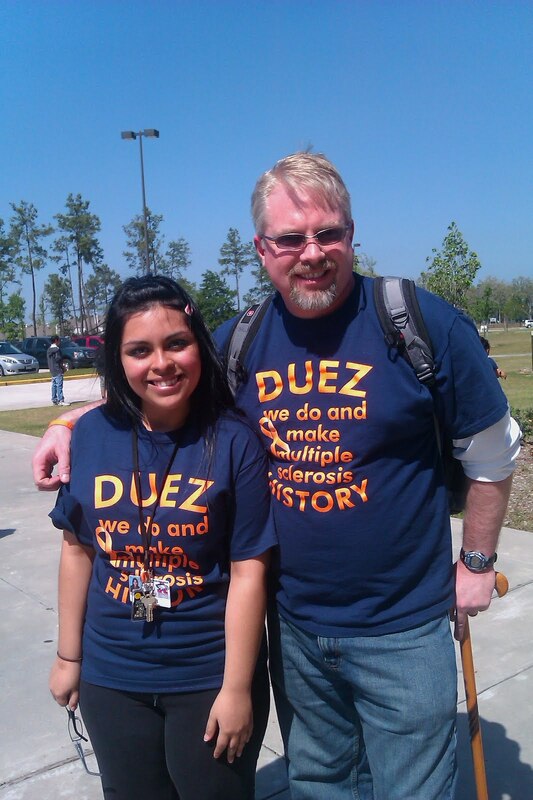 Mr. Duez's Junior AVID class with their "Duez Support Shirts." They are GREAT kids. My son Aidan is next to me at the bottom middle. Mrs. Duez brought him in for the end of the day as a surprise. Mr. Duez with two of his AVID seniors who have been with him in AVID for four years.